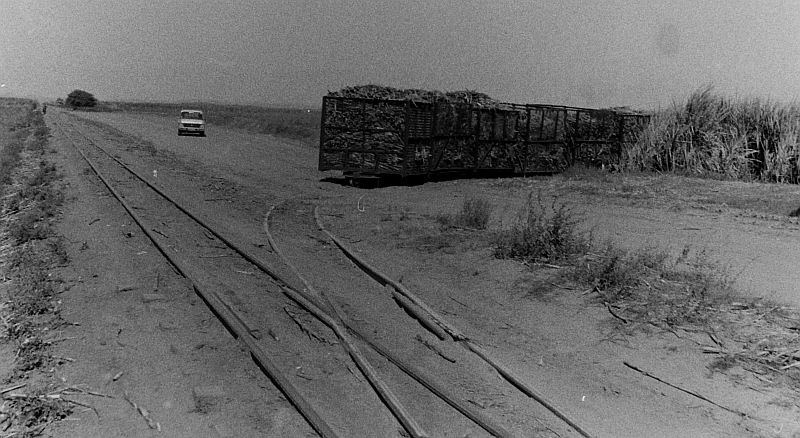 When I was young, there used to be narrow-gauge railways all over KwaZulu-Natal. 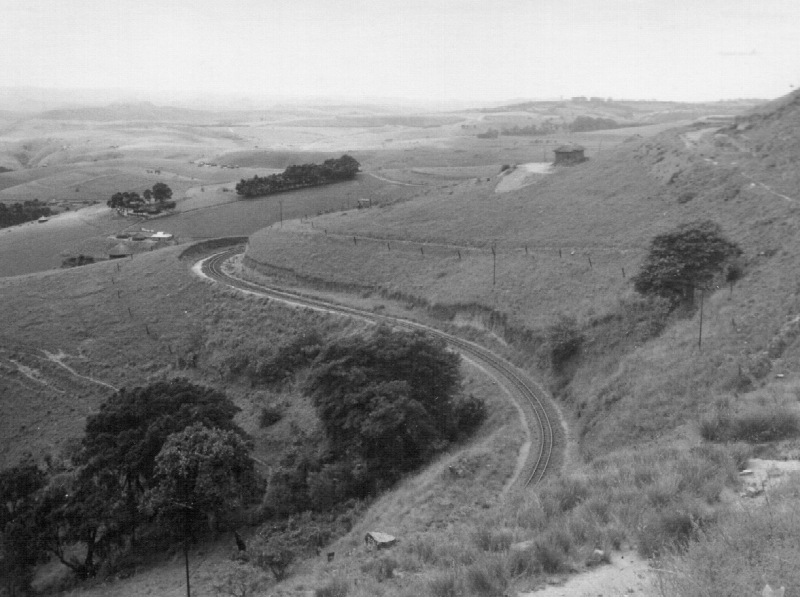 Many of them were branch lines, leading from mainline stations to villages in the Natal Midlands. 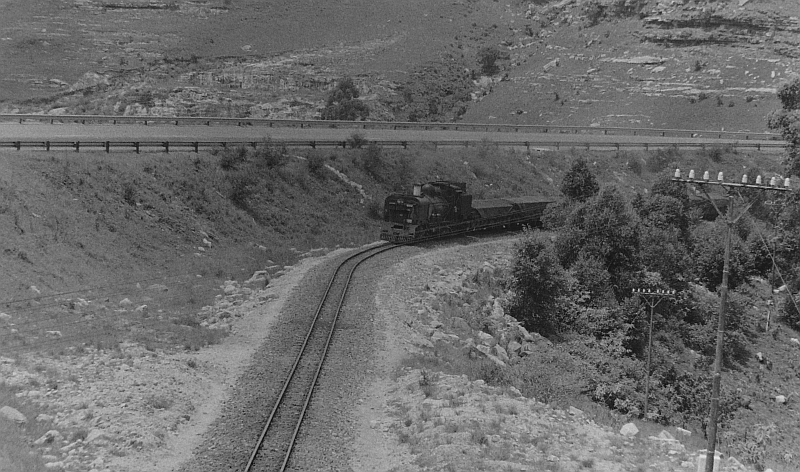 The area was very hilly, and the traffic was not heavy, so narrow gauge lines were much cheaper to build. In addition, in the coastal region, there were countless privately owned lines radiating from the sugar mills for taking cane from the fields to the mills to be crushed and refined. When I was 12 years old I spent a holiday with a friend at Mount Edgecombe, and we used to sneak out at 4:00 am, nick one of the cane trucks, and ride on it down the hill to the mill to beg for “treacle-toffee” — the caked residue chopped off from the cauldons in which the cane was boiled. We then used to ride back up the hill on a train pulling empty trucks out to the fields, and jump off when it got close to home. They were pulled by steam engines in those days, but I never got a photo of one. By the 1960s many of them had vanished, being replaced by “hi-los”, or Gila monsters, big diesel lorries that crowded the narrow roads. Smaller growers used trailers pulled by ordinary farm tractors. So when in 1980 I spotted what was possibly one of the last surviving cane tracks in Zululand, I quickly took a couple of photos. The steam engines had gone, but now the diesel that replaced them has probably gone too. 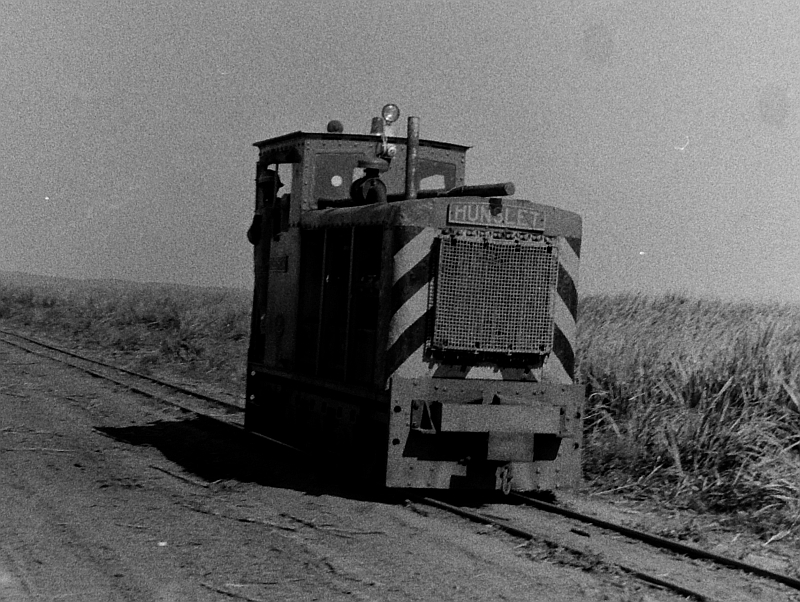 The tracks used to wander in and out of the cane fields, and seemed to be inviting one to a journey to a mystery destination, and the complex network of lines seemed to belong to a romantic different world. Being stuck behind a lumbering hi-lo on a narrow winding road was a poor substitute, and a great nuisance. When the cane was loaded on to the trains, it was burnt in the fields before being taken to the mill — the cane had to be burnt before it was crushed. I don’t know what they do now — burning it on a hi-lo would probably melt the tyres. 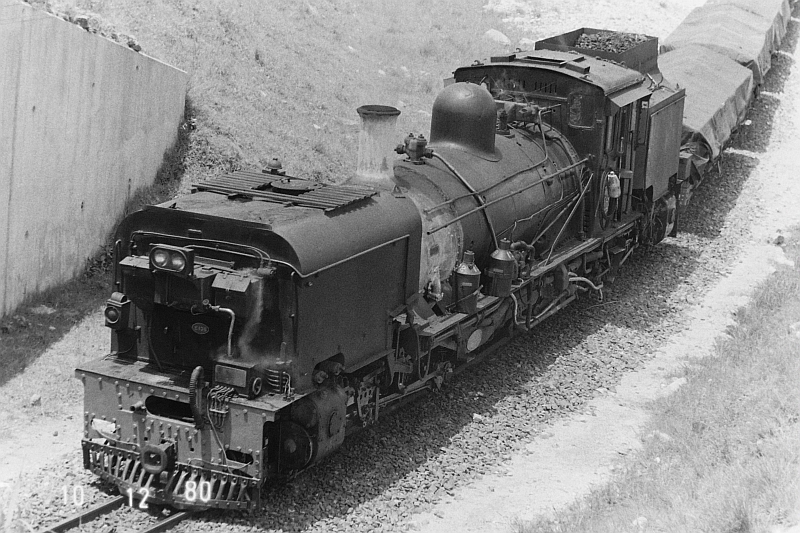 The cane trains were light railways in every sense, but the ones belonging to the South African Railways were “proper” trains. 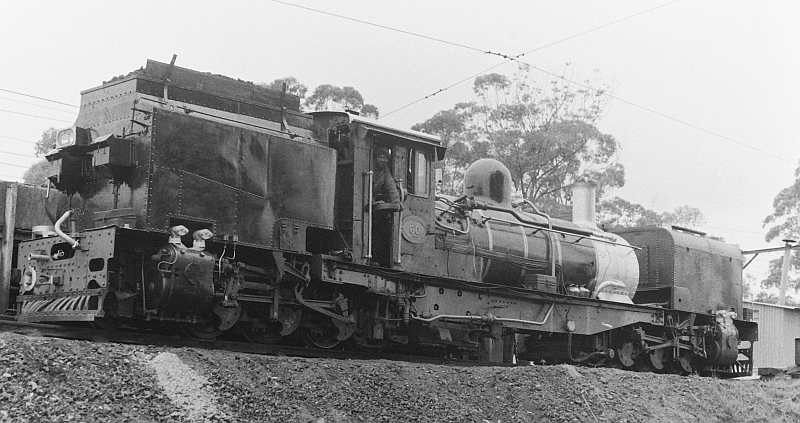 Their locomotives were many times bigger than those used on the cane tracks, and were often articulated Garratt locomotives, to cope with the sharp curves winding among the hills, which Alan Paton described so lyrically in the opening paragraphs of his novel Cry, the beloved country . Carisbrooke Halt, with corrugated iron waiting room, January 1972. This featured in Alan Paton’s novel Cry, the beloved country. The view of the fairest valley in Africa lies just beyond and to the right of the waiting room, but this post is about the trains rather than the view. The station at Carisbrooke, described in Alan Paton’s novel, was a branch off the line from Donnybook to Umzinto, and it the only one of the Natal narrow-gauge lines I have actually ridden on. A friend and I set out to hitchhike from Pietermaritzburg to Grahamstown on a long weekend, but after being stuck in Ixopo for hours decided to make for the coast instead, and got a lift from Highflats to Hluntankungu with a witchdoctor and from there walked three miles to to Jolivet, and seeing no lifts in cars likely and a train coming, ran to the station and hitched a ride on it to Umzinto (see The vanishing hitchhiker). I once wrote a children’s novel featuring an imaginary extension of this like from Donnybook to Himeville, but I haven’t found a publisher for it yet, and probably never will. [Update: published as an e-book in December 2014]. There was also a line from Port Shepstone to Harding, and I saw trains on it as recently as 1980. Because of the sharpness of the curves and the narrowness of the gauge, the trains could not mtravel very fast, but they did give one a marvellous view of the countryside that they passed through. 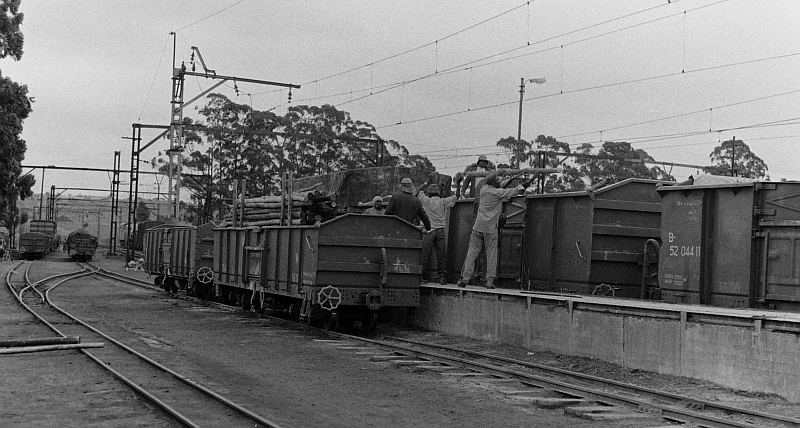 At Umlaas Road station, where the narrow gauge line from Mid-Illovo met the main line, the trucks would be placed side-by-side to transfer the loads. 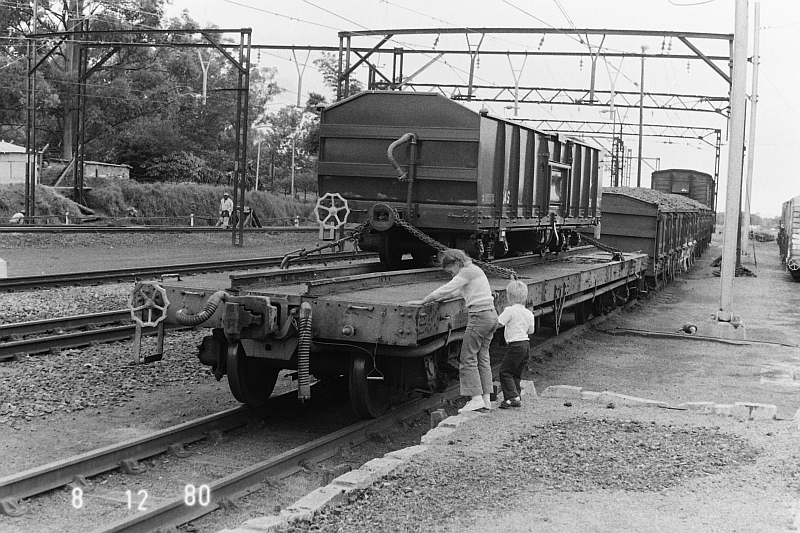 The narrow gauge rolling stock could also ride piggy back on the mainline wagons for trips to the repair shops in Durban. Most of these narrow gauge lines have now been closed. There used to be one between Estcourt and Weenen, but it was closed and the rails have been removed. The line used to cross the old Durban-Johannesburg road just outside Estcourt, but though I must have crossed it dozens of times, I never saw a train on it. And I believe most of the others have now been closed too. I’m glad we managed to get a ride on some of them before they did close. Most interesting – one could do a bit of train spotting there. After reading this wonderful post, I’m even more fascinated by the landscapes of “Cry the beloved country” .. Thank you! I cant leave this page until I pass a comment or three. Thank you for an interesting blog . If one visits the Weenan Game Reserve you are able to drive for a section along where the track was for the old narrow gauge train. it takes you through some rather narrow cuttings and little has been done to make it easy thus adding to the pleasure. I would not recommend driving through this with a low suspension car. I went through very comfortable with a 2×4. You dont need diff log or anything its just a very rough “road”. Secondly, I recently saw a few YouTube clips of theWelsh Highland Railways and low and behold they are running some of those very Ex South African Railway Narrow Gauge Garret locomotive like those in your photos. 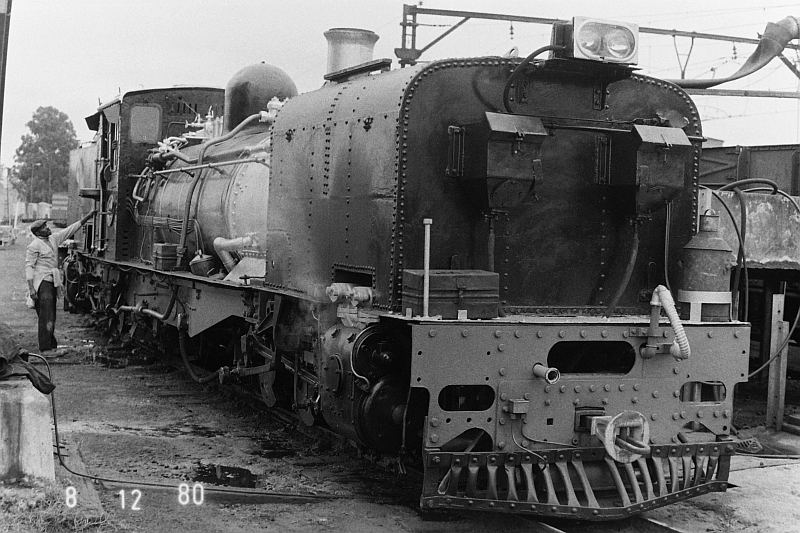 The locos are in pristine condition. Yes its ashame all that is gone and taken over by road transport.